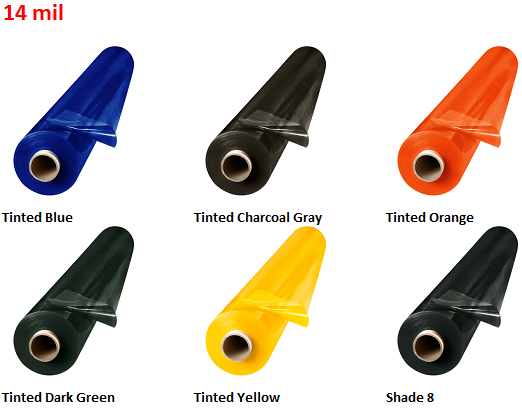 Welding curtain rolls are used to create welding and grinding shields to enclose work cells, robotic welding cells, and single sided curtains. 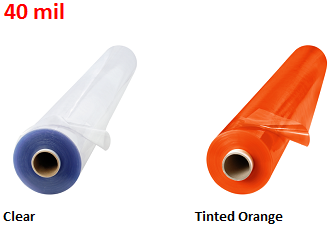 Simply unroll the welding screen roll and cut to your desired length. The rolls can have grommets spaced every 12″ at the top and bottom for easy hanging using zip ties or S-hooks. The welding rolls are ideal for welding stations where curtains are needed to completely or partially enclose the welding area. Please enter a number greater than or equal to 20. WARNING: Tinted transparent vinyl screens provide protection for casual passerby only and are not intended as a substitute for normal eye protection for close or long-term viewing. The user must wear protective eye-wear suitable for the application. 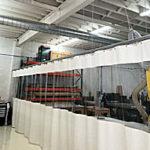 Clear transparent vinyl does not reduce harmful UV light from welding operations. 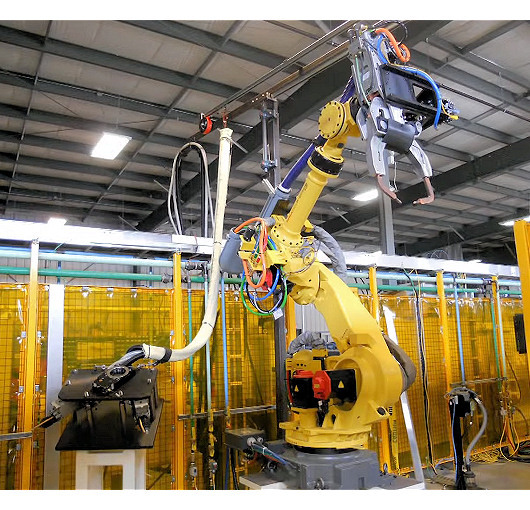 Many facilities use the welding roll screens to shroud the cages of robotic welding cells as shown in the picture. 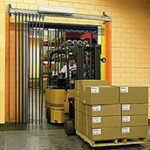 Simply unroll the weld curtain rolls and zip tie them to the structure of the enclosure. Will the Vinyl hold up to flying sparks? The welding vinyl material will hold up to hot flying sparks from a distance as shown in the picture below. Keep in mind there are different kinds of sparks. There are sparks from grinding the metal which these welding curtains work great for and then there are sparks which come from other work processes which are very large and sometimes molten. For that type of an application you would need to use the canvas material which is made for heavy close range heavy welding. 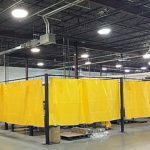 Are they FM Approved Portable Welding Curtains Also Called ANSI/FM 4950, or Hot work Curtains? 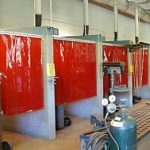 Hot works welding curtains and FM Approved welding curtains are a type of material that is used for heavy welding operations. These are applications where there will be high temperatures, sparks, molten splashing, and heavy slag present. 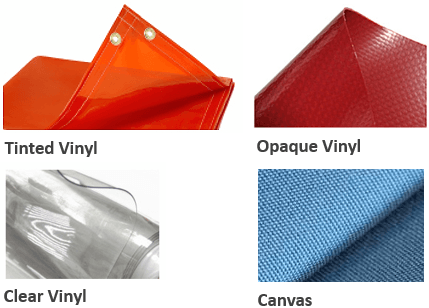 To meet this specification you would need to choose the canvas shade material.